Blowout Sale! Save 61% on the Micnaron Road Bike Helmet, Cycling Airflow Helmet Detachable Goggles Adjustable Shield Visor by Micnaron at Joes V Cycle. MPN: H1709180901A0. Hurry! Limited time offer. Offer valid only while supplies last. - Micnaron Road Bike Helmet equipped with detachable Googles provides protect to your eyes from sunshine and wind while your are ridding. - Shield Visor can be adjusted by one hand. No need to stop ridding. - Standrad size fits for Head Circumference from 22 to 24.5 inches. Suitable for both man and lady. 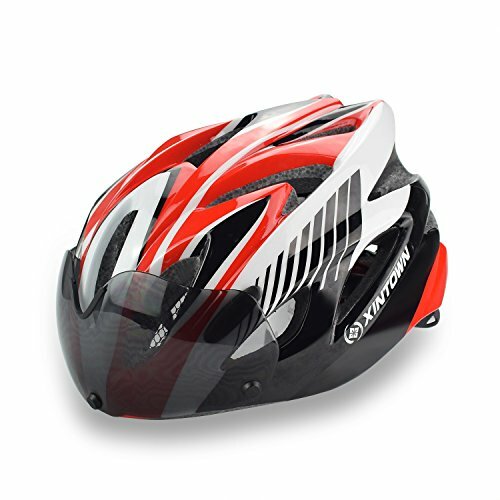 - Absorbing impact and effectively reducing the shock pressure to protect the head during crash. - Equipped with the easy-use dial system and side straps.